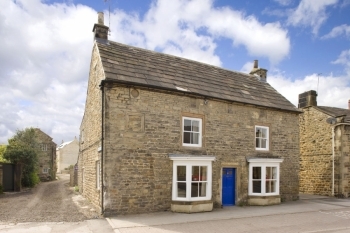 Accommodation in Masham, North Yorkshire. 4 brm Grade 2 listed farm house sleeping up to 10 guests and attached at the rear a 3 brm stable block sleeping up to 6 guests. Can be rented together or separately. Open all year. Special rates for mid-week stays out of holiday periods. Particularly suited to family groups, walled courtyard with BBQ - located in the town so all the amenities on the doorstep. Walk to the pubs, shops, market, breweries, cafes etc. Our 7 day weather forecast for Masham updated throughout the day, making it ideal for planning leisure activities, travel and events. Read more about our weather forecasts. On Sunday 21st April 2019 the sun will rise at 05:51 and will set at 20:20. It will be a mild day, with temperatures reaching around 21.5°C. Today is expected to be a dry day, with a very low chance of rain. It will be quite a breezy day, with a maximum expected wind speed of 16mph. On Monday 22nd April 2019 the sun will rise at 05:49 and will set at 20:22. It will be a mild day, with temperatures reaching around 19.9°C. Today is expected to be a dry day, with a very low chance of rain. It will be quite a breezy day, with a maximum expected wind speed of 19mph. On Tuesday 23rd April 2019 the sun will rise at 05:47 and will set at 20:24. It will be a mild day, with temperatures reaching around 16.9°C. Today is expected to be a dry day, with a very low chance of rain. It will be quite a breezy day, with a maximum expected wind speed of 19mph. On Wednesday 24th April 2019 the sun will rise at 05:45 and will set at 20:26. It will be a mild day, with temperatures reaching around 13.7°C. Some moderate to heavy rain is expected, 9mm of rainfall is possible today. It will be quite a breezy day, with a maximum expected wind speed of 22mph. On Thursday 25th April 2019 the sun will rise at 05:42 and will set at 20:27. It will be a mild day, with temperatures reaching around 13.9°C. A few showers are expected, 4mm of rainfall is possible today. It could be quite a gusty day today, with a maximum expected wind speed of 26mph. On Friday 26th April 2019 the sun will rise at 05:40 and will set at 20:29. It will be a mild day, with temperatures reaching around 14.6°C. Today is expected to be a dry day, with a very low chance of rain. It will be quite a breezy day, with a maximum expected wind speed of 22mph. On Saturday 27th April 2019 the sun will rise at 05:38 and will set at 20:31. It will be a mild day, with temperatures reaching around 7.6°C. Today is expected to be a dry day, with a very low chance of rain. There could be quite a strong breeze in the air today, with a maximum expected wind speed of 28mph. Our weather forecast for Masham is updated throughout the day and has been found to be very reliable for planning activities such as days out, leisure, travel, events, fishing, golf and gardening. 4 brm Grade 2 listed farm house sleeping up to 10 guests and attached at the rear a 3 brm stable block sleeping up to 6 guests. Can be rented together or separately. Open all year. Special rates for mid-week stays out of holiday periods. Particularly suited to family groups, walled courtyard with BBQ - located in the town so all the amenities on the doorstep. Walk to the pubs, shops, market, breweries, cafes etc.